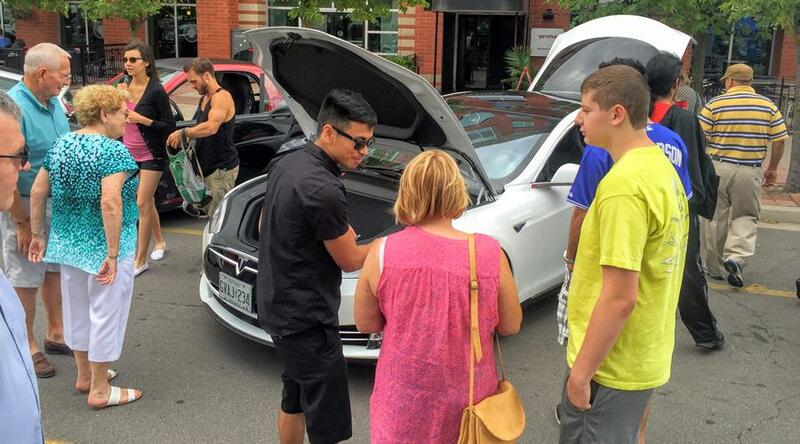 The "I Drive Electric" Cruise was a success. The Honourable Glen Murray, Ontario's Minister of Environment and Climate Change attended and said some words. We got fantastic media coverage on CBC Radio and CTV. We auctioned off a free ChargePoint residential charging station. We had a drive through photo booth where owners could get themselves and their car photographed with a handful of backgrounds to choose from (Toronto Skyline at Day and Night, the Suicide Squad, Elon Musk, Robert Lutz). There was an EV test drive provided by Chevrolet, Ford, Nissan, Mitsubishi and BMW in next generation electric cars. We had EV owners from across all brands attend, including: Audi e-Tron, BMW i3, BMW i8, Chevrolet VOLT, Nissan LEAF, Kia Soul, smart fortwo, Tesla Model S, Telsa Model X, Mitsubishi i-MiEV and Ford Focus. In celebration of National Drive Electric Week, Plug’n Drive invites all EV Owners to join us for the “I Drive Electric” Cruise at the Canary District in downtown Toronto. This event is Plug’n Drive’s way of recognising the leadership of early EV adopters who are lowering their carbon footprint and thanking them for helping Canada transition to a more sustainable transportation future. 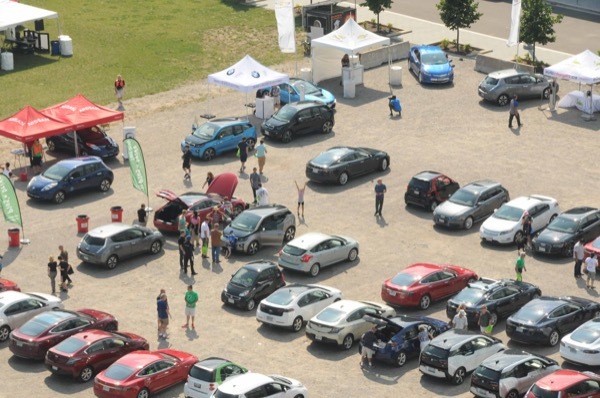 With parking for over 300 cars, all EV owners are invited to cruise down in their EV for a day of music, food, activities and giveaways to show off their cars, meet other owners and share their electric driving experiences with the public. EV owners are also encouraged to bring a friend who has yet to take the electric plunge in order to offer them free test drives in the latest EV models and introduce them to the EV driving community. There will be food available with seating, the “Electric Vehicle Avenue” exhibitor area with a display of the most current EV makes and models, charging stations and free EV test drives. Adjacent to Waterfront Toronto’s Corktown Common Park, the Canary District emphasises green spaces. Located a stones-throw away from the Distillery District and Lake Ontario, the Canary District is a shining example of 21st century modern living. Registered attendees report 534,866 electric miles driven.